We met our guide Danijela in front of the Hilton hotel garage just outside the Dubrovnik Old Town. It was a short walk from The Peti Apartment we were staying in. We stood across from each other for a little while with our guide Danijela thinking is that the family I am looking for? After a couple more minutes we ended up meeting half way with the introductions. Mark and I were both waiting for other people to start turning up but as the departure time grew closer and closer for our Dubrovnik to Mostar day trip. still, there was no-one else joining our group. Could we be so lucky that we were the only ones on the trip that day? We waited some more and while we did we chatted about Croatia and Australia. As a small mini-van pulled up in front of us Mark finally asked ‘is there anyone else on the tour today?’ and to our complete joy, the answer was no! We had the car and the guide all to ourselves! Amazing. This was going to be a fantastic day! Marley and Bec climbed into the back, which left Willow and I sitting in the middle set of seats. Danijela sat up the front with the driver, Dragan. Once onboard and settled we made our way along the Croatian coastline for about an hour. Danijela pointed islands that lie off the coastline and explained their history. The best thing about it was she just turned a little in her seat to speak with us which meant that we could ask as many questions as we liked. We passed a botanical garden where Game of Thrones was filmed and I wished we had time to stop so I could look. There are just so many extra little places dotted all over the place that you don’t even realise are in the show until they are pointed out to you and Danijela seemed to know them all. As we started to slow down Danijela asked us for our passports. We entered Bosnia briefly and they were needed to be checked. We all got very excited that our passports were getting another stamp in them and we had to explain that to Danijela and Dragan! They thought it was funny that we were excited over that. There is a section on the coast where you must enter Bosnia for a 10km stretch before going back into Croatia only to enter Bosnia again later. This made us all very happy as we love to cross borders and get stamps for our passports! Danijela told us we were lucky to come in winter as the wait to cross the border can be 1 hour at each point in summer. 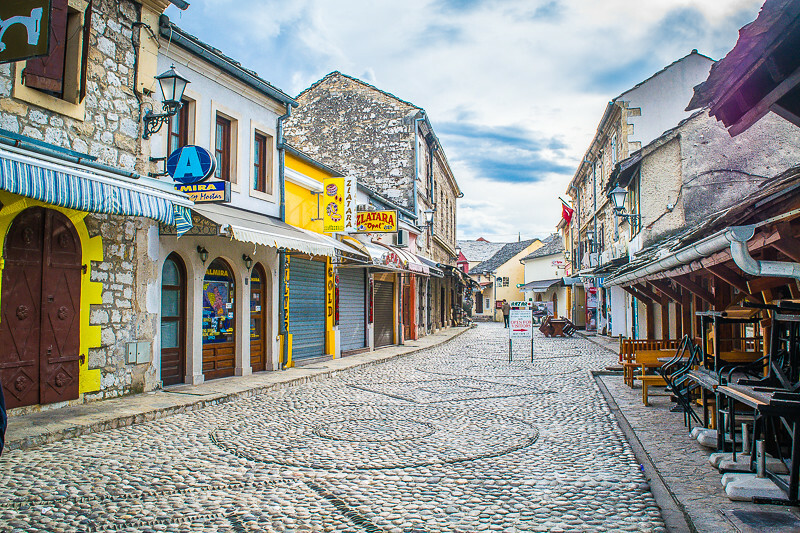 We made a quick stop in the only town on the coast that lies in Bosnia for a cup of coffee and some cake. The town was called Neum. This was a great time for us to go to the toilet as well. There is a little shop next door which I went into just to get an extra bottle of water and some more things for the girls to nibble on as they were nearly out of snacks. Back on the road, we crossed back into Croatia. From there we headed through the fertile lands of Croatia where grapes, olives and mandarins were growing on both sides of the road. We made a quick stop at Počitelj for some photos. Počitelj is currently on the tentative list for UNESCO status. It was a strategic defensive town in the 15th century. Today there is still a castle ruin and a Mosque to be viewed. Both of the girls stayed near the car with Dragan while Danijela took us up to look at the Mosque. You could get a great view of the castle from here and we were able to take some pictures of it as we walked up to the Mosque. Unfortunately, we were not able to go into the Mosque but we listened to Danijela as she told us about the town and the role in history it had played. All the little stone buildings and the stone paths made for some beautiful pictures. We then headed back to the car where Dragan and the girls were waiting for us. 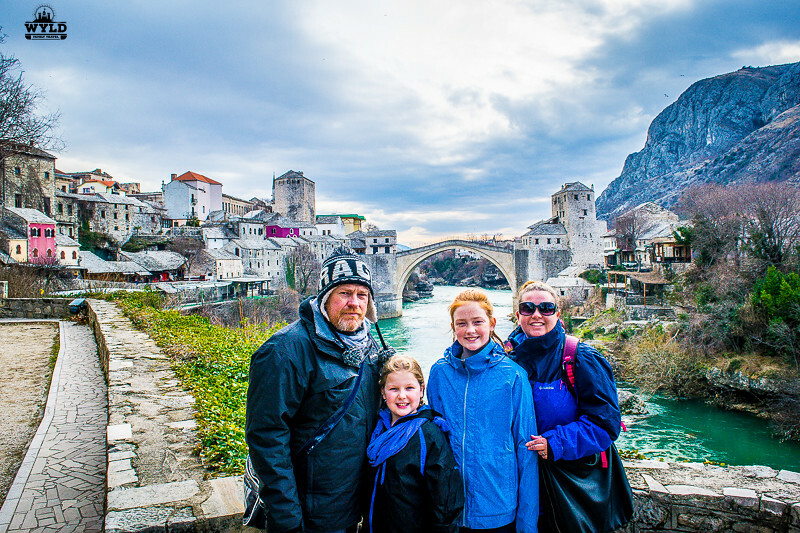 Our Dubrovnik to Mostar day trip continued on. 15 minutes later we entered Mostar. Danijela explained to us that a local guide from Mostar, Selmir would take over. We picked him up in the van and we went to a central point in Mostar where it would be easier to access the sites we wanted to see. As we drove Selmir explained the quick history of Mostar. Ranging from the Ottomans in the 14th century to the Austrians in the 18th to the Bosnian war in the 1990’s. 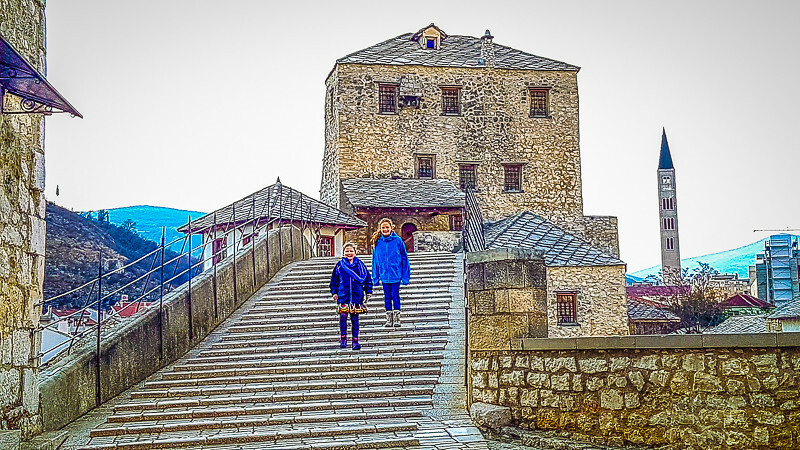 Over 90% of Mostar was destroyed in the war and the rebuilding is still happening today, we could see plenty of it was we drove and even more after we got out and walked. Our first stop was at a traditional Turkish house from the 15th century. This was one of only 3 left in existence in Mostar. It dates back to the time when the Ottomans ruled in Bosnia. 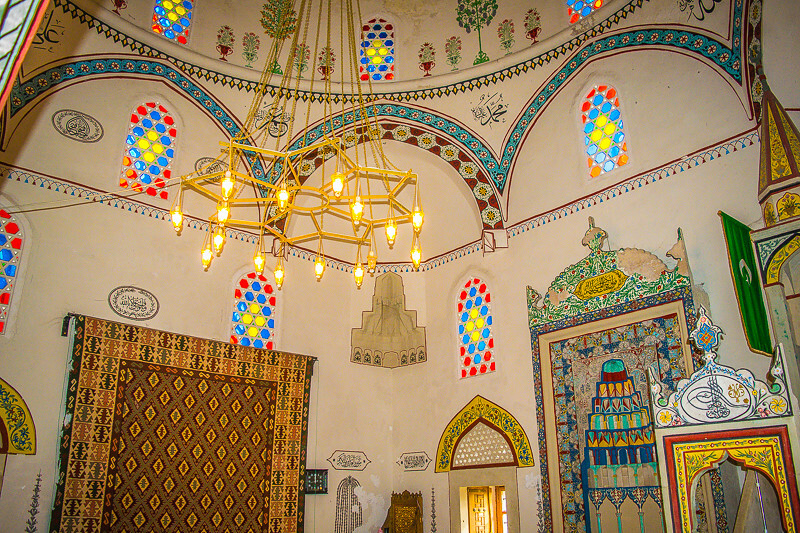 It was beautifully decorated with traditional pieces. Normally it would not be open at this stage of the year but we were so lucky that we got to see it and hear Selmir tell us about its history. The girls loved the bright mats that decorated the house. From there we headed to the Koski Mehmed Pasha Mosque. Selmir, who was a Muslim himself was happy to answer all questions we had about Islam. It was refreshing to get answers on the most misunderstood religion in the world. We were told about the call to prayer, the Iman’s job in the mosque and thoughts behind women wearing the burka and a hijab. This was excellent and the type of information that I like my kids to hear. The girls listened eagerly to the information and asked questions which Selmir happily answered, so they were able to understand. Exposure to other cultures and religions is why we travel. Information like this presented properly can only make our girls more understanding and accepting of others. 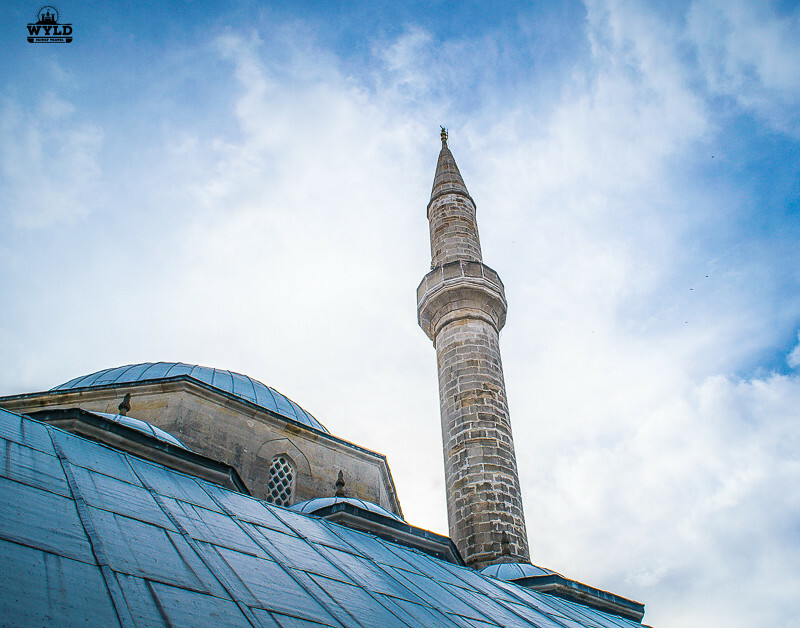 The Mosque provides the best view in Mostar of the famous bridge and it was a sight to see! We spent a long time listening to Selmir talk about it and just looking at it. The Bridge was unfortunately bombed and destroyed during the war with Serbia but was rebuilt with funding from other European countries at a cost of 4 million dollars. It was rebuilt the same way it was before it was destroyed. Selmir told us that they tried to recover the stones from the water below to rebuild with but they were not able to be used after so much time in the water. Upon completion of the bridge, it was UNESCO classified. 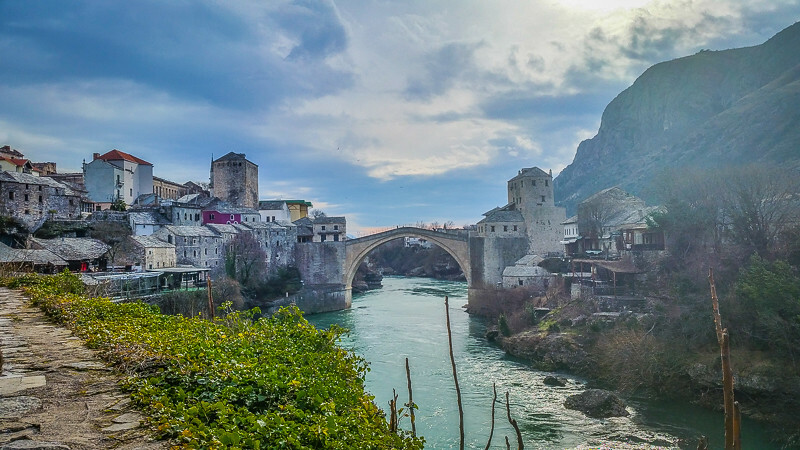 Now the bridge and Old Town of Mostar are a World Heritage Site. 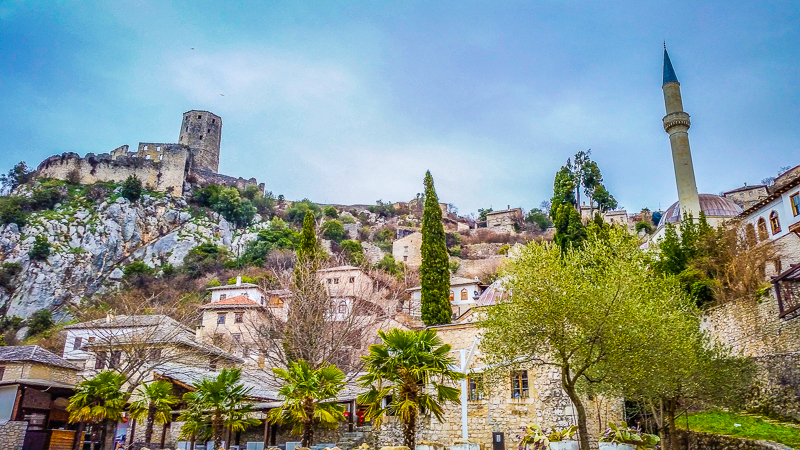 After we had finished gazing at the Stari Mostar bridge Selmir walked us to the Old Town. He showed us where a good place to eat was, where to get some amazing Turkish delight and for Bec some beautiful souvenirs. Selmir left us there in the Old Town where we had 2 hours spare time before having to go back and meet Danijela and Dragan. 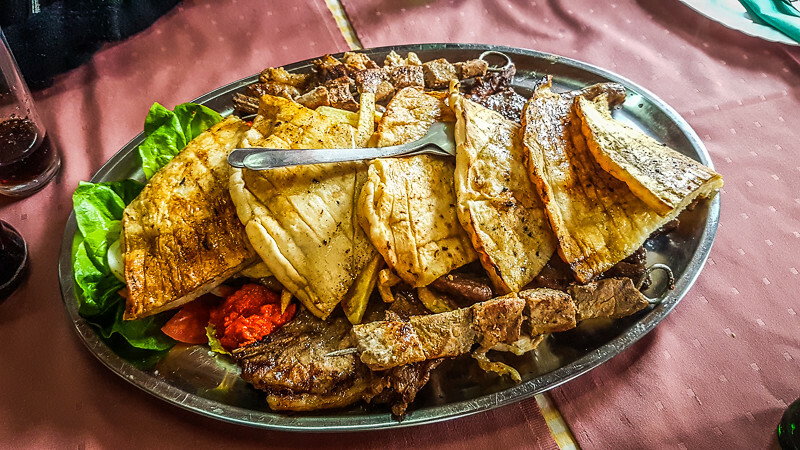 We had lunch at Restaurant Europe and we chose the Bosnian meat platter. The platter was full of all types of meat and the local speciality called Cevapi which are like little sausages. The other speciality is a type of meat patty called Pljeskavica. The platter was for 2 but 4 of us could not finish it., even though it was so amazing we tried our very best. We also had a traditional Turkish coffee before we left. It was a beautiful way to end our lunch in Mostar…Turkish coffee overlooking the bridge. We did some shopping in the Old Town. The Old Town is known for its copper and tinsmiths. We bought a coffee grinder and coffee pot, some homemade slippers, a Muslim prayer mat, a platter and the most amazing tasting Turkish delight! Bec could have shopped for hours but our time was running out. And we still had to cross the bridge to get to our meeting point. As we approached the bridge it seemed that we were the only people in Mostar. For about 5 minutes we were the only people standing on that famous bridge. As we looked down into the swirling water below I wondered how people possibly jumped off it and lived. It just seemed so high and the water was rushing so fast. I would have loved to see someone jump but there was no one around that seemed like they would. So, for now, I will have to settle for seeing it on TV. We stayed on the bridge for as long as we could and the girls loved going up one side and down the other. People started to pass us and smile at the girl’s joy. We made our way a few hundred meters back to meet our mini-van for the trip back to Dubrovnik. We had an amazing day in Mostar and it will be one that will stay with us for a long time. When we finally got back to Dubrovnik the girls had a hard time saying goodbye to Danijela and Dragan. They had just connected with them during the day which was great! Another amazing experience and another wonderful set of guides. We booked our Dubrovnik to Mostar day trip through Viator and you can too. Click HERE for booking details and prices. Looks like a wonderful trip! I’ve been to Dubrovnik and on a road trip in Croatia, but never did it to Bosnia. Thanks for sharing a couple of good tips! 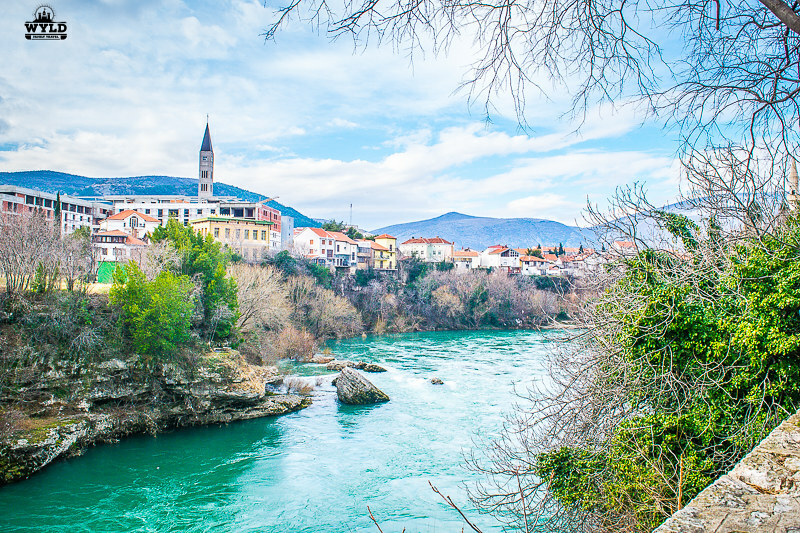 WOW the pictures look so darn gorgeous – looks like a fairytale town particularly the Mostar town. I can totally understand why it must have been tough saying goodbye to Danijela and Dragan. An amazing read! The pictures are more than awesome. I liked the still of the Neretva river the most. Can’t wait to take a trip. Croatia looks more beautiful with every photo in your post. The sites, the food, the people etc. It all just looks incredibly inviting. The water is also so crystal blue! Thanks for inspiring a trip there! The places look like they leapt out straight from the pages of a fairytale. You were indeed lucky to have the trip all to yourself and enjoy the beautiful vistas in exclusivity. Would love to get there some day, can see what a great time you had. It is heartening to note that most of the places are virtually secluded. This place is really incredible! I can totally imagine feeling the breeze and embracing the sea! Such a peaceful and quaint place. The kind of place I would love to travel to. We were in Dubrovnik in August last year and also took a day trip to Mostar. Like you we had a great time. Such an interesting city to explore with so much history. Unlike you though, we didn’t get a chance to get our passports stamps at the borders. Our guide told us that sometimes they just don’t do it if they think you are an obvious day tourist. Ashame for us as like you we love to get our passports stamped! But we got to see seven crazy New Zealander jumping off the bridge in Mostar. That was a true spectacle and I was really scared for their lives! I certainly wouldn’t be doing i myself! Pocitelj is known by the Art colony, usualy International. 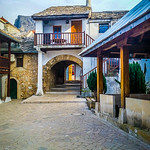 Have you visit The Cave inn Mostar?! The biggest chance to see the jumps from the Olden Bridge are by the end of juli. Boys are jumping from a few other bridges but it far more dangerous and not for begginners. This area is definitely on our plans for next trip to Europe. Great post and saved for reference when we are in the planning stage. Now that’s a wonderful blog post- wonderfully described and beautifully captured on lens! Počitelj looks great. In your blog post, I would have loved to know more about its heritage but overall the post is absolutely amazing!